This is the last post I will do on Hedgehogs apart from updates on LH. The first thing you must know is they are solitary creatures you can't have more than one living in a cage 2 males or 2 females will fight and kill each other and a male and female will mate and kill the litter over and over again.Males grow Smaller than females so this should be a factor to think about too! Housing:You will need a high plastic sided cage like a large bunny cage or large aquarium tank(size 40" by 15"minimum) as hedgehogs can climb quite well and need a lot of room.for bedding you can line it with paper shred but no ink as it is toxic or the shredded hamster/gerbil bedding or hay or straw.No bedding made from wood as Hedgehogs are allergic to wood oils,but some breeders say wood chipping or the wood type kitty litter is OK.I would also recommend a piece of fluffy blanket or a furry piece of fabric as it reminds them of there mothers furry tummy and they like it.but you will have to wash it and clean their housing daily.And it will need a quiet spin running wheel as hedgehogs can run 5 miles a night,this will need cleaning daily too as the poop as they run. Food:High meat content cat or dog food with no fish or fish derivatives or animal derivatives ground up in it,left over meat with seasoning washed off chopped up,mince meat like beef or lamb,with cat biscuits or you can get proper hedgehog food from a pet shop or garden centre,for treats little bit of peanut butter ,peanuts,small bits of melon or banana,Berry's,meal worms and very occasionally a little bit of lactose free cheese and fresh water in a small bowel.Never give them Fish or milk as this will make them sick or even kill them. Hygiene:Hedgehogs need to have a bath each day with about an inch or so of warm water use Johnson's no more tears baby shampoo or a kitten shampoo with a soft tooth brush to clean the spines and feet,Hedgehogs enjoy a bath and a swim in deeper warm water but supervised as when they get tired they could drown and don't let them mess in the water.Trim nails if getting long.See you vet about treatments for parasite's if needed other wise just keep them clean and their housing clean. This covers most of the care a pet hedgehog needs.The other thing is Hedgehogs sleep through the day and are active at night so can be played with in the evenings,if you let them out to run about make sure the run area is free from nook's and cranny's that they can get into as you might lose them. They need to be handled at least once a day for about an hour to encourage them to open up and stop them getting grumpy,if you can handle as much as possible in the evenings they can bet a friendly loving pet.I would also have a safe enclosure that is hog proof with paper to run on for about 10 Min's before handling as they are likely to poop and pee on you when first woken up and they can't help it.After handling wash your hands just a precaution as they could have dirt on there feet you can't see. 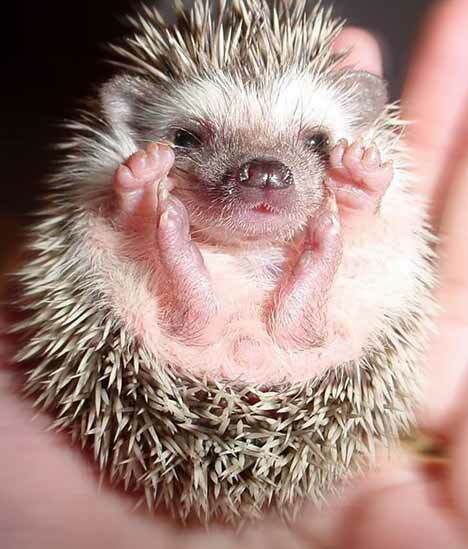 One other point is they are not legal pets every where,some states in the US and some areas in Canada they are illegal,some US states require a permit and in the UK these are the only ones that can be kept as pets and the European wild hedgehog is illegal to be kept as a pet everywhere!So this would be need to be checked. Hedgehogs are sold in some of our pet shops but with very little information on how to properly care for them. Thanks for this post. I hope people who want to adopt a hedgehog would do their research first. That was some fantastic information on those cute little critters. I hope they all get the proper care and love! That's really great information. They are so cute! I learned some new info today from reading this! Thanks rach! They are cute..I love the little feet! Thanks so much for this window into the hedgehog world. I really had no idea. Still the most amazing thing is that you are sheltering a real UK wild hedgehog, with Sir Speedy's help of course. I hope every creature in the garden has a great winter. Nighty, night, Lucky Hogwartz! thats the nice bit LH! thats a lot of hard work,and I thought Speedy and the hubby and now LH was enough...Phew! I know what you mean,they are cute but then so is Coccolino!